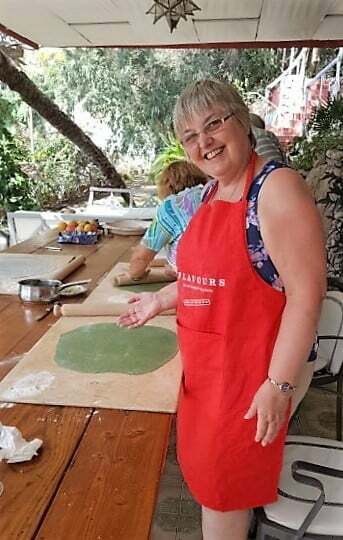 This year we helped Lindsay celebrate her 60th birthday on the Amalfi Coast, doing a cooking holiday with friends and family at the beautiful Villa Limonaia near Praiano. Here, Lindsay talks to us about sea-view siestas, a day trip to Capri and a birthday cake to remember. Our base for the week was the incredible Villa Limonaia, which Flavours Holidays uses for its cookery holidays on the Amalfi Coast. I’d previously done a cookery course with Flavours in Tuscany, and people there had raved about the course on the Amalfi Coast. It sounded like the perfect spot to celebrate my 60th. Why did you organise it through Flavours Holidays? You don’t turn 60 every day, and I just didn’t want any hassle. There were seven in our party, with various different dietary requirements, and Flavours just sorted it all. They booked flights, transfers, meals and so on, and the lovely villa host Antonella escorted us on all our excursions – they basically treated us like royalty. What was the villa like? Oh my goodness, it was beautiful. I think it had been designed in the ‘60s by a famous Italian architect, with lots of different levels clinging to the hills, so that that it just sort of tumbled down toward the sea. There were so many outdoor areas, so the whole time you’re just so aware of the sea and the views across the sea to Praiano, and everywhere you looked there were lemon trees and lemon-covered trellises. A path leads down through the lemon groves to a private rocky cove right on the water. It was utterly magical. How much cooking did you do? Both Lorne at Flavours Holidays, and Antonella, made it clear that it was our holiday, and that we must do as much or as little as we wanted. So, apart from the one day that we all went to Capri to celebrate my daughter’s birthday (Antonella came along and sorted out all our various boats and funicular railway tickets), we would cook every morning. It was all pretty relaxed though: we wouldn’t start till about 10.30am or 11am, so there was plenty of time for delicious breakfasts in the sun on the terrace, or a morning dip in the beautiful salt-water pool. We cooked a lot of traditional Neapolitan food, so lots of gorgeous, sardines and sea bream, so fresh it was practically wriggling. And pasta, of course: gnocchi and tagliatelle – we learned to make them all. In fact, I’ve just been chatting to my daughter and just this morning she was making gnocchi at home. I must say, the results were fantastic: every day we would have lunch on the terrace, eating whatever we’d just cooked, and we surprised ourselves with the quality of the dishes. The local reds and whites – all included in the cost of our stay – helped! And we also made a delicious limoncello, which is a speciality of the area. Did you see much of the Amalfi Coast? Oh goodness, yes. Pretty much every day after lunch we’d go out with Antonella, so we visited Ravello, Pompeii, Positano, and we had a whole day in Capri. It is such a beautiful part of the world, with all these beautiful, ancient villages clinging to the cliffs above these sparkling blue seas. Sometimes we would eat out, drinking in the scene from seafront trattoria or cobbled town squares. It was just amazing. Tellingly, we stayed in all day at the villa! It was such an idyllic place just to be, so that’s where I wanted to celebrate the day. It was wonderful: swimming, reading, chatting. Then at lunch the chef, Rosa, suddenly produced an amazing lemon cream and fruit birthday cake, and musicians appeared and played to us between courses. I could not have asked for more. 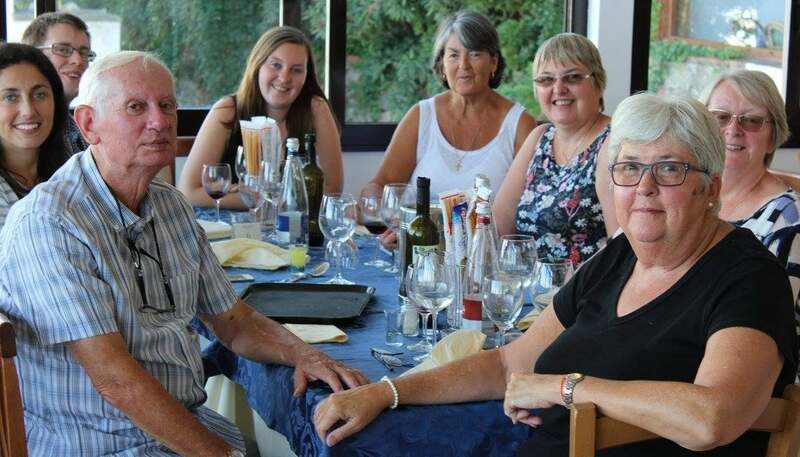 Flavours organise activity holidays to Italy and Spain. Where would you like to go? We offer a personal service to all our guests to give us a call to chat more about our holidays.